In the past few months, the government have come up with a response to its consultation paper of July 18, 2017 in regards to private corporation taxation. On December 13th 2017, they released the final version of the rules in regards to income splitting proposed to be effective starting January 1st 2018. 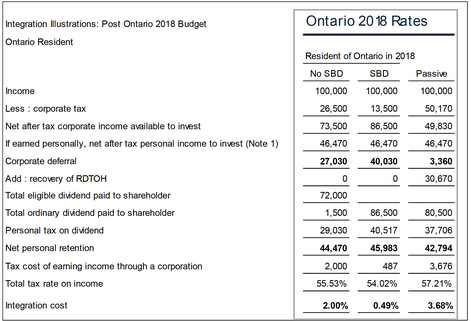 While in their 2018 budget announced February 27th 2018, they released new rules in regards to passive investment income which would start in the first corporate year end after 2018. The purpose of this paper is to address both of these changes, and how they may affect your upcoming corporate year ends as more work may be required to ensure we comply with the new rules while maximizing your corporate tax structure. Previously, and still in place today, we had what was called the “kiddie tax” as the government main tool to prevent income splitting. The kiddie tax was put in place to apply to individuals who were under the age of 18 and receiving sources of income such as dividends from a private corporation. When the kiddie tax was applied, it would make it that the minor would be taxed at the highest personal marginal tax rate, therefore eliminating any potential advantages from income splitting. In most cases, the kiddie tax was one of the main reasons why we never declared dividends to minors. The new rules presented on December 17th, 2017 look to be applied regardless of the age of the recipient on certain types of income. If the split income earned was not from a business carried on by a related person or by a business where the related person owns 10% or more, then TOSI will not apply. This exclusion will rarely be used, as in most structures, at least one family member either owns more than 10% in the corporation or is actively engaged in the business. To qualify for this exclusion, the family member must be engaged on a regular, continuous and substantial basis in the business. There exists two ways to meet this exclusion, first is the threshold, which is set at 20 hours a week all year long. If the family member worked at least 20 hours a week in the business in the current year then TOSI will not apply to that person. The second way is basing the argument on facts, which would be much harder to prove. Also included in this exclusion is that if the family member at any point in the business worked 20 hours a week for the whole year for any 5 previous years, then that person will qualify for that exclusion moving forward. This exclusion is what I call the “retirement package”, therefore, the government has decided that if someone worked the minimum weekly hours for 5 years in the past they will be able to get the exception indefinitely in the future, which is similar to benefiting from a retirement plan once you no longer work. This exception works for income earned directly or indirectly, therefore, if a family member is a beneficiary of a trust and respects the 20 hours a week test, then the exclusion will apply to them even though they are not direct shareholders in the business they worked for. The issue with this exclusion will be documentation as we do not have any directive or guidance on how CRA will look for sufficient proof of having a family member meet that 20 hours a week threshold, particularly in a family business setting where it could be hard to dig up past year time contributions. In order to qualify for this exclusion, the family member would have to own directly 10% of the fair market value of all issued shares and 10% of all votes. The business must also not be a professional corporation (ex: doctors, lawyers, accountants, etc. ), less than 90% of the business income of the corporation for the last taxation year was from the provision of service, and 90% or more all of the income cannot have derived directly or indirectly from related businesses. It will be hard to apply this exclusion do to its limit on service-based business with represent roughly 78% of all business in Canada. It is also unclear what CRA will consider to be a service or not, for example, in a plumbing company, part of the business will be considered selling products, whereas installing the product might be a service, therefore will we need to do a specific breakdown, or argue that there are 2 separate businesses. UPDATED : Per STEP 2018 CRA round table, CRA as stated that the "excluded shares" exclusion will not apply to holding corporations, because if the corporation has no business income, its shares cannot qualify as excluded shares. The following condition must be met : (Service Income) < 0.9(Business Income), therefore (0) < 0.9(0) would not work. The holding corporation would require to carry on a business of its own that is not derived from a related business. CRA later clarified during the 2018 APFF round table that depending on the level of activity, carrying on a business could be managing investments or rental units. The reasonable return exclusion will usually be of last resort. If we do not meet any of the other exclusions, then we can look to what would be a reasonable return for an adult family member who is 25 years of age and older. For example, we could evaluate what would be a reasonable salary for that family member considering their contribution to the business, and that salary could therefore be given in the form of a dividend instead of a salary. Both the total dividend and salary would have to be considered in order to determine the reasonability of the dividend. This will be a very factual question, which is why we should always try to find another exclusion to avoid TOSI and not solely rely on the reasonable return exclusion. Capital gain that arises from the sale of shares where we meet one of the previous mentioned exclusions will not have TOSI apply on that gain. For example, a family member that worked 20 hours a week for 5 years in the past will not have TOSI applied on their shares when they sell them, however, if none of the other exclusion apply, that family member could have TOSI applied on the gain. The government has left us, for now, the chance to keep income splitting on capital gain as long as the shares qualify for the lifetime capital gains exemption. This also applies to minors with a few other conditions. Those types of shares are usually shares of an operating company that does not have any investments or excess cash. It will therefore be even more important in the future to set up holding corporations to make sure the shares in the operating company continue to qualify for the lifetime capital gains exemption if ever one day we envision selling the business. The government heard our complaints about how employees with their pensions or individuals with RRSP were allowed to income split those sources of income and how it was not fair that they could not do the same in regards to their own corporation. Therefore, they have come up with what we call the “baby boomer exception”. Thus, when an individual who is 65 or older, who TOSI already does not apply to them because of another exclusion, then TOSI will also not apply to their spouse or common-law partner, allowing income splitting. The proposed new rules to prevent income splitting are a step in the right direction from what the government previously proposed, but still come with a lot of uncertainty in their applications, issues, and present a lot more administrative complexity which goes against previous promises. In order to discuss the changes to the taxation of investment, we must first take a quick look at our current rates, and how investments are currently being taxed. Both provincial and federal government recently announced a reduction in the small business tax rates, what used to be a 15% combined tax rate will go down to 13.5% in 2018 and 12.5% in 2019 (18% and 17% for Quebec, respectively). These rates apply for the first $500,000 of earned active income. Every dollar earned beyond the $500,000 threshold will be taxed at 26.5%, which is unchanged from previous years. The first $500,000 of small business tax rate is shared between all associated corporations. There are many ways for corporations to be associated, the easiest way is by having the same person or group or person control more than one corporation, then all those corporations would be associated. For example, Mr. X owns 51% of OPCO and 100% of HOLDCO, therefore OPCO and HOLDCO are associated and must share the $500,000 of small business deduction. When a corporation pays taxes at the higher rate of 26.5% it creates room to declare eligible dividends to its shareholders, which are taxed at a lower rate than non-eligible dividends. This is part of the integration rule so that the overall tax burden, whether you empty the corporation by means of salary or dividend, should be similar. In theory, the corporation could have avoided the 26.5% tax by bonusing down to the small business limit. The “integration” is not perfect and changes year to year depending on the government corporate and personal tax rates, and factor in our annual decision of whether to declare dividends or salaries. Investment income is generally taxed at 50.2% depending on the source of income (interest, rental, half of capital gain), of that 50.50% tax, 30.67% is refundable when enough dividend is distributed back to the shareholder. For example, on $100 of investment income, there will be $50.50 of tax but $30.67 will be refundable when $30.67 is given back to shareholders as dividends. Dividend income is taxed at 38.33%, which is fully refundable once the same amount of dividend income is declared back to the shareholder. For example, earn $100 of dividend and declare $100 of dividend back to the shareholder in the same year will result in no tax on that dividend income. Therefore, when generating passive income, there is motivation to want to distribute dividends back to the shareholder in order to reduce the tax burden in the corporation. This is of particular importance when planning salary and dividend planning. We will now discuss the two changes that were introduced in the federal government’s latest budget, which will begin to apply in your first corporate year end after 2018. The first change is the introduction of a “grind down” of the small business deduction for an associated group. For every passive income dollar earned above $50,000, the corporate group will lose $5 of small business deduction. Therefore, once an associated group of corporations earns above $150,000 of passive income, there will be no more small business deduction, and 100% of the active income will be taxed at 26.5% instead of 12.5% (in 2019). In brief, what is considered investment income for the purpose of this grind down will be regular investment income, such as interest, dividend, rental income, half of the capital gain, etc. What will be excluded is capital gain derived from active assets. For those of you wondering, “what about the “grandfathering” of investments promised by our finance minister?” There will be none. Now that we will be in a situation where corporations will be taxed at a higher rate, we will want to take advantage and declare eligible dividends to compensate for the extra tax. Currently, a company that has both room to declare eligible dividends and has refundable dividend tax on hand (which is the sum of tax paid on dividends and tax on investments that is refundable) can simply declare an eligible dividend and get the corporate tax refund as well. The government has deemed it unfair that not only would the shareholder get an eligible dividend tax at a lower rate but that the corporation would also get a tax refund. Therefore, as usual, they decided to complicate the situation by going from one pool of refundable dividend tax to two pools of refundable dividend tax - one called eligible refundable dividend tax on hand and the second called non-eligible refundable dividend tax on hand. In the first pool we will have the sum of taxes paid on eligible dividends received, while in the second pool will have the 30.67% portion of tax on investment. Therefore, you can only recover the 30.67% by declaring a non-eligible dividend not an eligible dividend like we could before. Therefore, every year in order to maximize the corporate situation, we first will have to keep track of two separate tax pools for dividends’ tax refunds, and possibly declare two separate dividends to both maximize the corporate tax refund and minimize the shareholder tax liability. Currently for 2018, the combined personal top marginal tax rates for dividend income is 46.84% for non-eligible dividends and 39.34% for eligible dividends (39.83% and 44.83%, respectively for Québec). There are important transition rules from 2018 to 2019 which will demand important planning for those who have unused eligible dividend room. Those who are affected will most likely see big eligible dividends declared before the implementation of these changes. Here is an updated illustration presented by the Canadian Tax Foundation showing the current integration cost with the current rate. Because it is a cost, it means that it is better off not being incorporated to generate that source of income, or to bonus down income to $0. It also does not take into account the tax deferral, it makes the assumption that we empty the corporation each year by means of dividends, which is usually not the case. Such as the new TOSI rules, the new regime on passive income taxation is better than what was originally proposed by the government but is still a very imperfect system with a lot of grey areas where we hope the government will clarify for us, or even change for something simpler. The new changes will add a lot more administrative work for both the corporation and the tax preparer to make sure that the new rules are applied and maximized in your advantage. We look forward to the challenge! If ever you have any questions or concerns, please do not hesitate to get in touch with us. I will now go over some of the exclusions available. Moving forward, every time we give a dividend to a family member, regardless of age, we will need to take a look at the list of exclusions to see if yes or no the TOSI rules will apply to that dividend. -Income gain from the disposition of certain property. TOSI does not apply to salaries because they are already subject to a “reasonable” test in order to be deductible in the business. With the new rules, when the individual receiving “split income” is a Canadian resident, the TOSI rule will apply and, therefore, will see that source of income taxed at the highest personal marginal tax rate. By default, all dividends that are distributed by a Canadian private corporation to a Canadian resident will be subject to the new TOSI rules. The only way to avoid its application is by falling within one of the exclusions planned in the new TOSI rules.